Whether it is via the auction of allowances or the taxation of carbon emissions, climate policy is increasingly being seen as a source of revenue into the national treasury. For example, the Australian carbon pricing mechanism will raise several billion dollars per annum in its fixed price period (currently $23 per tonne CO2) and EU member state revenues from the ETS have risen as power generators in particular now face full auctioning of allowances, rather than the mainly free allocation that has existed since the system started in 2005.
to cover administrative expenses of the management of the Community scheme. Support for lower income people to offset the carbon price. Support for Research and Development on low carbon technologies. Investing in low carbon / low emission projects and energy efficiency schemes. ICMM have built the report around a core principle which they extol, namely “apply climate change related revenues to manage a transition to a low carbon future”. 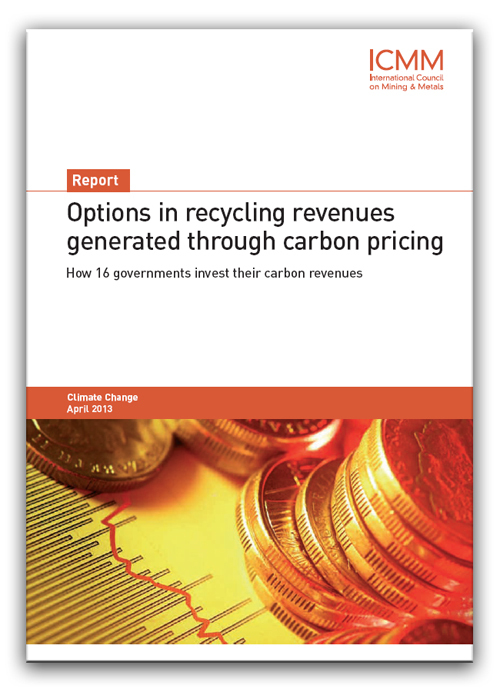 The report is excellent and well worth reading, but it does raise a very fundamental issue around the direct hypothecation of carbon revenue. This is isn’t just a governance issue though. Australia serves as an interesting recent example. The decision to link the Australian ETS with the EU ETS followed by the precipitous drop in EU carbon prices has caused Australian government carbon revenue projections to be adjusted (down) accordingly. Recent headlines in Australia suggest that those relying on government support for various energy initiatives are now concerned about the certainty of that support and the overall level of it going forward. This concern stems from the fact that carbon revenue has been earmarked against certain objectives, such as in the categories listed above. The alternative approach is to largely delink the collection of revenue and its use, which is the standard practice for most government expenditure. After all, why should we imagine that the collection of carbon revenue and the needs of the economy to make the transition to a much lower emission state should follow the same path. In the very early years, expenditure on R&D and demonstration projects (e.g. CCS, solar thermal etc.) may require funding far in excess of the available carbon revenue, which is often low at this stage as governments introduce a new tax at a modest level or give the bulk of the ETS allowances away for free. Further, at this time the need for guaranteed support for those first tentative investments is critical for long term deployment pathways. Some years down the road carbon revenue may be very large and probably in excess of the transitional needs, which then argues for the bulk of the money to flow to general revenue. This will lead indirectly to reductions in other taxes, but the linkage would be unspecified. In this case, forcing the use of a large revenue stream on specific objectives may become a market distortion in itself. It is the job of the underlying mechanism (e.g. carbon tax, cap-and-trade, energy pricing) to drive deployment of a new set of energy technologies, not government against the need to spend earmarked revenue. This is an issue that will likely run and run, assuming carbon prices ever recover to some meaningful level. The ICMM report is a useful contribution to the discussion and certainly gives an excellent overview of current practices. However, it does enter the discussion with the somewhat myopic view of ongoing hypothecation. British Columbia took a different approach with their carbon tax revenue: It was recycled through tax cuts. The economics literature suggests that this is the approach that leads to the lowest cost emissions reductions. David Hone is hereby declared the 2013 recipient of the Captain Louis Renault Award.